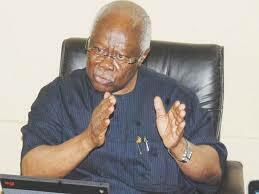 A former Deputy National Chairman of the Peoples Democratic Party (PDP), Chief Bode George, has said Nigeria’s democracy is now under threat because of godfathers. In a statement on Friday titled, ‘We must respect the will of the people’, George said, “Our democracy which has been sustained for almost 20 years is now wobbly, unsteady, and fraught with all kinds of aberrations. He noted that the 2019 general elections, was another opportunity for Nigerians to fix the broken system. Goerge added, “At the end of the day, everyone becomes a victim of the tyranny of a vain, greedy minority. But this nation can do better. Let us rebuild our moral ethos. “Let us recommit ourselves to the core integrity of the Athenian Democracy where the popular will reign supreme over the narrow interest of the few.